Several months after the fair ended, Lemare was honored with the position of San Francisco’s first Municipal Organist in which he was contracted to perform two concerts weekly. San Francisco had become home. Lemare’s salary was ten times that of the average worker and was guaranteed, regardless of ticket sales. Lemare was one of the highest paid organist in the world. But his impressive salary did not go unnoticed. City supervisor J. Emmet Hayden–earning a modest 15% of Lemare’s annual wage–publicly attacked Lemare’s salary and performance, encouraging city officials to reconsider the musician’s value to San Francisco. When the time came to renew Lemare’s contract, the city offered a mere 60% of his original earnings. After heated negotiations, Lemare agreed to a salary that was only slightly better. This was to be only the first of many political battles to come. The final blow came from the city elections of November 1920. A proposed ordinance submitted by Supervisor Hayden and the Board of Supervisors, would reduce the salary of the city’s municipal organist to $3,600, a far cry from the $10,000 salary originally paid to Lemare. Despite opposition by The American Guild of Organists and then Mayor James R. Rolph, the voters approved the ordinance. On Sunday, June 26, 1921, Lemare performed his 190th and last official concert on the organ he had come to cherish. Feeling rejected by the city he loved, Lemare accepted a position as the municipal organist for Portland, Maine and, later, Chattanooga, Tennessee. He eventually retired in Hollywood, California. 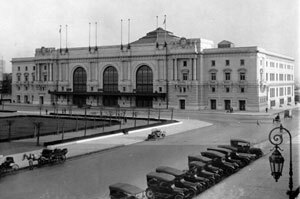 Throughout the 1920s and early 1930s the Civic Auditorium and organ would remain the cultural focal point of San Francisco. Both the symphony and the opera would perform in the auditorium until the new Opera House opened in September of 1932. Historically significant concerts by world famous organists and composers including Marcel Dupre and Camille Saint- Saens would over time be featured on the historic Exposition Organ. Throughout the 1940s and ’50s the Exposition Organ was used occasionally for conventions, graduation ceremonies and large religious events. But for the most part, the popularity of organ recitals and interest in municipal organs began to decline. New sources of musical entertainment such as phonographs and radios, the growing popularity of big bands, distractions and restrictions during World War II and a tendency among professional musicians to disregard the artistic limitations of “average concertgoers” began the downward momentum. In 1962 a $20 million bond issue was voted in by the citizens of San Francisco. These funds allowed for the rehabilitation, reconstruction and modernization of the Civic Auditorium. Considered a part of the building, the Exposition Organ was entitled to a small portion of these funds and underwent a thorough cleaning, releathering and installation of a new console. But the windfall proved to be a double-edged sword as the ill-conceived remodeling robbed the auditorium of its good acoustics, dampening the sonic character of the organ. 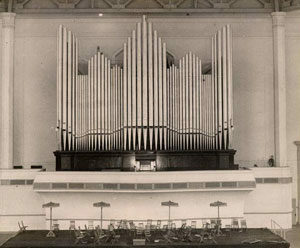 Furthermore, a “casino-style” curtain was hung in front of the Exposition Organ muting its tone and concealing the great instrument from public view. As a result of cost overruns on the Civic Auditorium reconstruction/modernization project, the city stopped appropriating funds for maintenance of the instrument and it fell into disrepair. Now cloaked in a curtain of darkness, the once distinguished Exposition Organ faded into obscurity.